Searching for the right costume for a nativity play or pageant can be difficult. Many people either resort to making their own or paying a high price for a professional costume. But it doesn’t have to be that way. Your child can be in command of the stage during their play when they choose one of our Biblical costumes, including this child Mary costume. Now your little girl can look like she just stepped out of a nativity scene! This Child Mary Costume is ideal for any Christmas play and would make an adorable costume for a Christmas card picture. Become the symbolic religious figure in this cute costume for girls. Your child is now ready to lead her people and command a crowd in this realistic Mary costume. A great choice for any little one who’s got a Christmas pageant or play coming up. 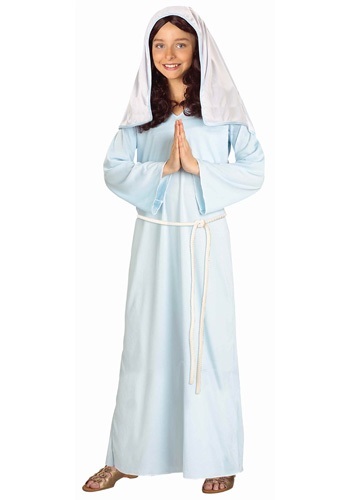 This child Mary costume is made of 100% polyester, so it’s both comfortable and durable. The lightweight costume starts with a long-sleeved light blue dress that is modest and minimalist. A white braided rope belt ties around the waist for added authentic detail. A light blue headpiece is also included and it secures with an elastic band for a secure and comfortable fit. Pair this costume with one of our Jesus costumes or other Biblical costumes for a great group look for a play or for other holiday events. Perfect for your little one’s activities!